(c) the accidental mispronunciation of a dear friend’s middle name and surname at a citizenship ceremony, leading to him being called Loudner Horth for all his days forthwith? If you guessed (c), you’re right. Go have a drink to celebrate. In fact, why not make yourself a Loudner Horth – as this week’s cocktail is now known – in his honour? Strange as it may sound, 52 Cocktails has an Irish friend who doesn’t like Guinness. When he became an Australian citizen recently we decided to celebrate by creating a drink that looked like Guinness but didn’t taste like it, something that would be a nod to his Irish heritage with an Australian twist. This is because we are stubborn bastards who refuse to take the easy route of just serving Irish whiskey to an Irish dude at a citizenship party and would prefer to experiment for days with stereotypical Irish ingredients such as Baileys, leprechauns, potatoes and Guinness in order to create a new Irish-influenced drink. The Loudner Horth is the result of all this crazed scientific experimentation (as is a new hole in the ceiling and a visit to the emergency room, but let’s not mention that). It’s a deconstructed Guinness, meaning it’s meant to look like a Guinness without quite tasting like one. It comprises two parts served in two separate glasses: there’s some doctored Guinness in one glass, and some doctored Baileys in another. (Yes, we decided to serve Guinness to someone who hates it, because we are idiots.) Let’s just say that again: no, not the part about being idiots, the part about how the Loudner Horth MUST be served in two separate glasses. This is because, as tempting as it is to shake the whole lot together, trying to combine Baileys and Guinness is like trying to combine a politician and a straight, logical answer during an interview: it just won’t work. Unless you’re Heston Blumenthal and have access to an actual laboratory and a whole bunch of molecular know-how, if you shake it all together, or even attempt to pour the Baileys mixture over the Guinness mixture in a clever layering experiment, you’ll be left with a curdled-looking, almost greasy substance that’s as horrible to drink as it is to look at. Trust us, we’ve tried it – and suffered the consequences. Follow the recipe below and you’ll wind up with a decent drink that’s best combined in your mouth by taking a sip from each glass before swallowing. Start this recipe the night before you plan to serve it. Serves 4. Any small glass will do – try a shot glass or a sherry glass. Combine all ingredients in a mixing glass and leave to infuse in the fridge overnight. When you’re ready to serve, shake the mixture with ice in a cocktail shaker, and strain into four small glasses. Combine all ingredients in a mixing glass. Leave to infuse overnight in the fridge. When you’re ready to serve, shake the mixture with ice in a cocktail shaker and strain into 4 tumblers. Happily, instead of looking like the flat black liquid that’s been in your fridge all night, it will now look like a freshly poured Guinness. If it’s too sweet for your liking, top with additional Guinness. 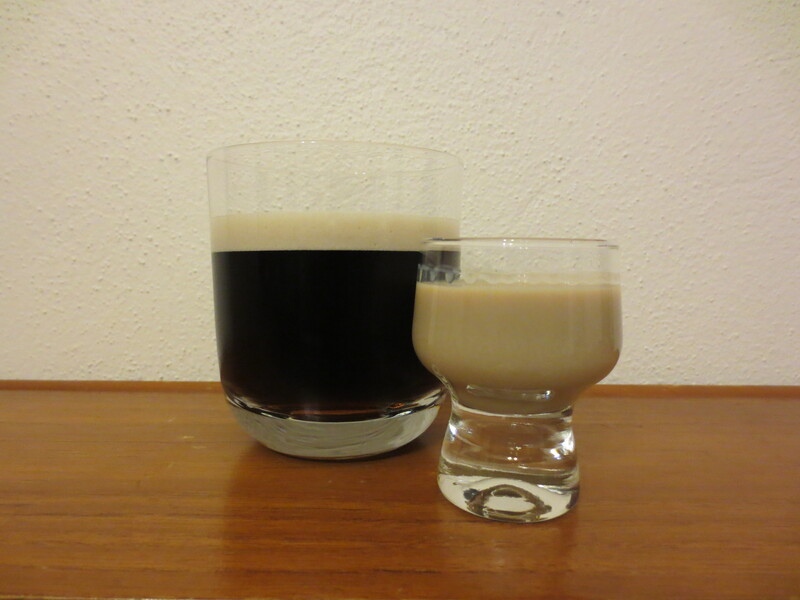 Serve each guest one glass of the Guinness component and one glass of the Bailey’s component. Instruct them to sip the Guinness part and hold it in their mouth, then sip the Bailey’s part, let the flavours combine, and then swallow. It’s a bit fiddly – a bit fiddle-dee-dee, if you like – and you end up with lots of glasses to wash, but it’s still easy enough to make. This one’s by 52 Cocktails – no one else is stupid enough to claim ownership of it!